In light of the recent hurricane and flooding in Texas, wildfires in BC and Manitoba, and Hurricane Irma headed towards Florida, we felt we should discuss how to be prepared for an emergency when you have pets. It is far too easy to think “Oh it will never happen to us”, but the small effort involved in being prepared is worth the peace of mind should a disaster strike. There are plenty of resources for home disaster kits (both DIY and pre-made ready for purchase), but for those with pets we also need to consider planning for our animals as well. Spare leash and collar/harness with ID – Include the dog’s name, your name, contact information and a secondary person to contact if possible should you not have access to your phone. 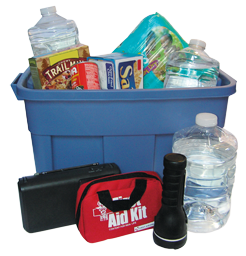 First aid supplies – Your own first aid kit should cover your needs but we suggest adding a few extra rolls of gauze, and some vet wrap as well. Two weeks worth of food – Dry or canned is fine (include a can opener if using canned). Remember that the food will have a shelf life of around a year so each year you will need to replace if not used. Water – On top of the water you will need for yourself and your family, you will need clean drinking water for your pet. Medication – If your pet requires medication make sure you always have a supply on hand. Medical records – Should you need to board your dog, most places will require proof of vaccinations. If you are not home and your area is evacuated, can you ask a neighbour to get your pets? If possible, who will go home and get the pets if evacuated? Where will you go if evacuated? Is your pet crate/kennel trained should they need to stay at a kennel? If an evacuation is in the future (or a possibility) who can stay home from work so pets do not get left behind? When an emergency happens you will be running on fear and adrenaline, so it is best to plan ahead and have one less thing to worry about.